Grand Army Plaza is the gateway to Central Park. Of the four corners of Central Park, it's the only one that is officially part of the Park's 843-acre landscape. It is actually two plazas. 59th Street bisects it into two semicircles, a split design inspired by Paris' famed Place de la Concorde. The southern half, opposite the Plaza Hotel, is home to the Pulitzer Fountain. Sculptor Karl Bitter designed the fountain in the Italian Renaissance tradition. The fountain is crowned with a graceful bronze figure of Pomona, goddess of abundance. On the fountain's plaza, as well as on the northern plaza, are flowerbeds designed and maintained by the Central Park Conservancy. The plaza was finished in 1916. It takes its name from the Grand Army of the Potomac, which was the Union Army in the American Civil War. 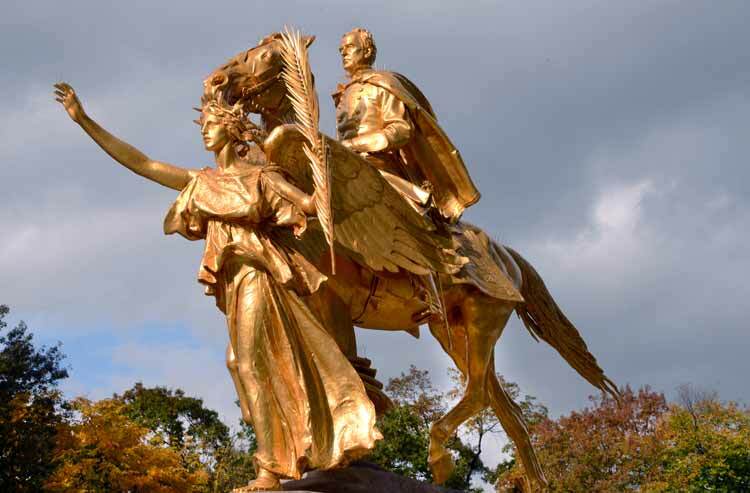 The bronze statue depicts Union General William Tecumseh Sherman by American artist Augustus Saint Gaudens. When the Civil War ended, Sherman moved to New York City and rode his horse and carriage through Central Park daily. The project involved repaving the plaza according to its historic design, regrading it to be wheelchair accessible, and overhauling drainage and irrigation infrastructure. Existing lamps and deteriorated benches were also replaced with new ones based on the design of the original features which were installed in 1916. Finally, the Conservancy replaced the trees around the perimeter lost in a snowstorm in October 2011. The plaza now features a new double row of London plane trees, consistent with the original design. And to top it all off, the brilliant gold statue of General William Tecumseh Sherman, sculpted by Augustus Saint-Gaudens also got a touch up. Conservators cleaned the bronze and applied new gold leaf to the surface. Finally, a protective coating of wax — tinted to emphasize the sculptural detail of the monument — was layered on top. Fifth Avenue between 58th and 60th Streets.